NBC’s Premier League pundits will swap places this weekend to add variety to the coverage of the world’s most popular sports league on US television. US-based pundits Kyle Martino, Robbie Earle and Robbie Mustoe will head to England to commentate games and offer their pitchside analysis, while UK-based pundits Lee Dixon and Graeme Le Saux will head to the United States to add their analysis in the NBC studio in Stamford, Connecticut. Premier League Live and Goal Zone host Rebecca Lowe will be joined Dixon and Le Saux for the “analyst swap,” while Premier League play-by-play commentators Arlo White and Derek Rae will be joined by Earle, Martino, or Mustoe to call this weekend’s matches and contribute analysis from select pitchside desks. Coverage begins Saturday, April 14, at 6:30 a.m. ET with Premier League Live on NBCSN. Rae and Martino will commentate Liverpool v. Bournemouth at 12:30 p.m. ET on NBC. Then, at 2:45 p.m. ET on NBCSN, White and Mustoe will handle the commentary for Tottenham v. Manchester City, with Earle pitchside. On Sunday, April 15, Premier League Live studio coverage begins at 7:30 a.m. ET on NBCSN, and White will be joined by Earle to announce Manchester United v. West Bromwich Albion at 11 a.m. ET on NBCSN, with Martino and Mustoe pitchside. 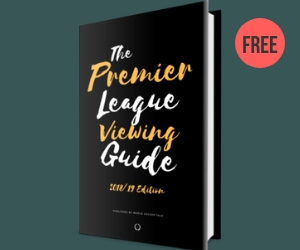 Live Premier League coverage on Monday, April 16, begins at 2 p.m. ET with Premier League Live on NBCSN, followed by White and Martino commentating for West Ham United v. Stoke City at 3 p.m. ET on NBCSN. Why not include Lowe and White in the exchange as well? That would be fun.